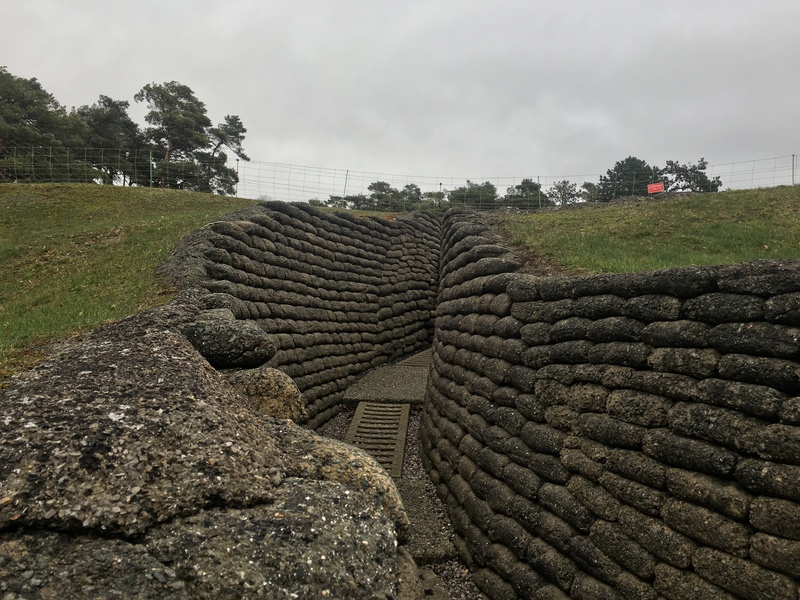 trenches | Poverty, Agony, Distress & Want! So it’s hard to believe that we’ve already arrived at the halfway point of the tour already. Where does time go? It has been an awesome time so far, and there is so much more yet to come. 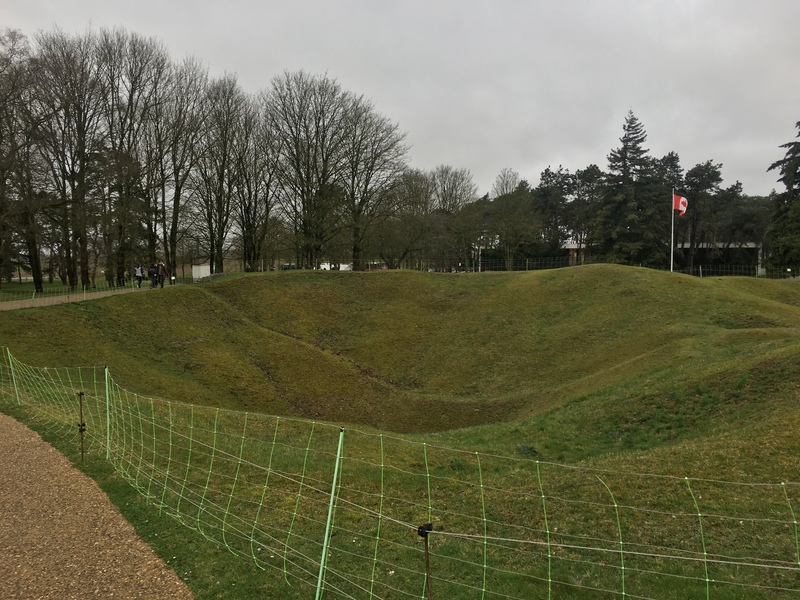 Today is the transition from the WWI part of the tour (Ypres, Arras, Somme and Vimy) to the WWII part (Dieppe and Normandy). Many of the places we will visit are a contrast between tragedy and triumph, the proud moments in our history and the darkest days. In the end we will commemorate it all, and remember those who fell. We’re back on the bus now on our way to Dieppe. 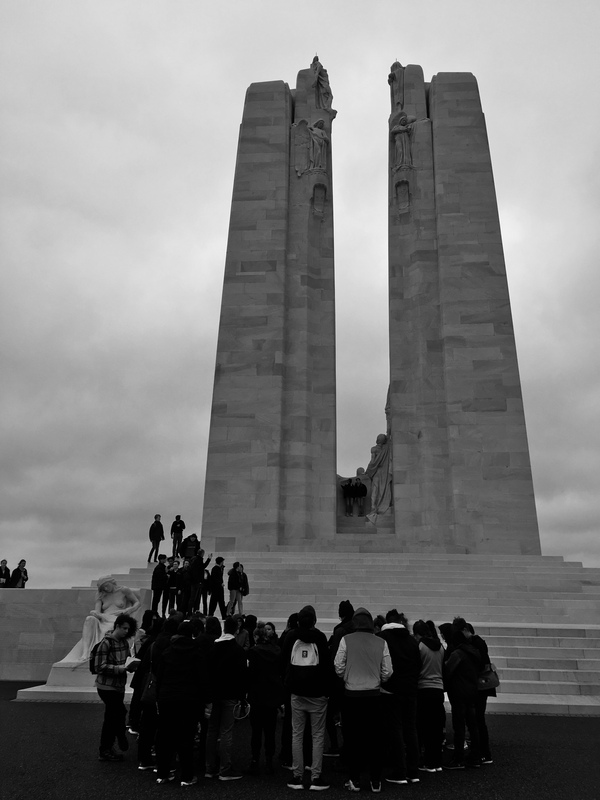 Again it was another amazing visit, and such a huge part of Canadian history. 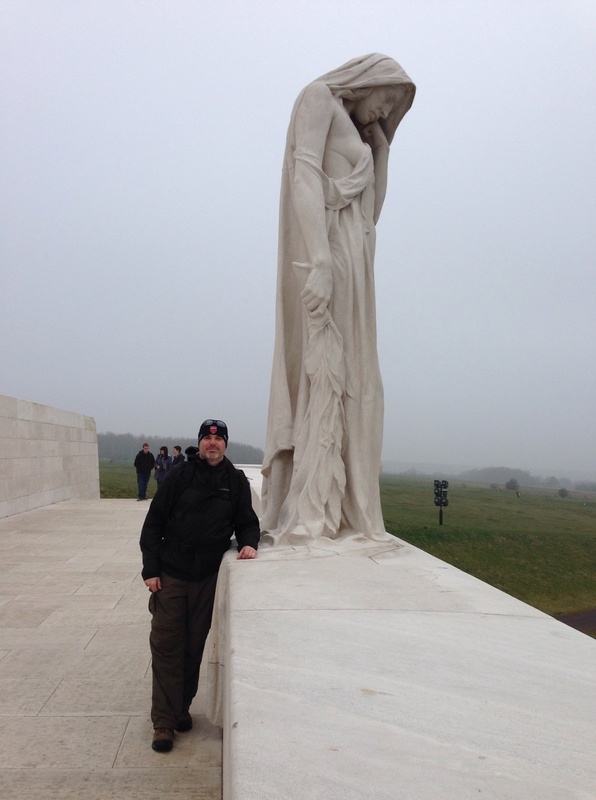 Even though I was at Vimy in 2012, it was still a very emotional event. 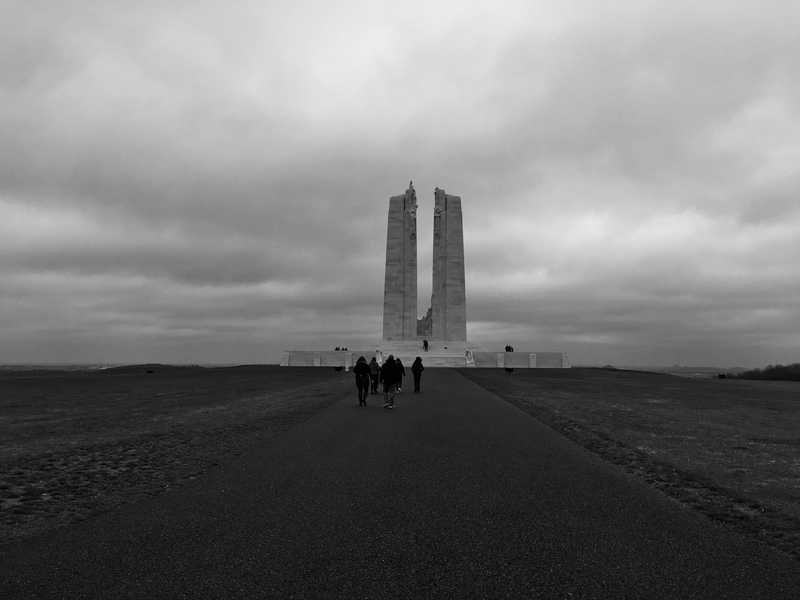 We started off at the visitor centre, and then made our way up the ridge to the memorial. It is really something that you cannot describe to ascend that hill and see that amazing sight. The memorial itself is massive and fills one with pride to see this towering tribute to the success and sacrifice of our nation. 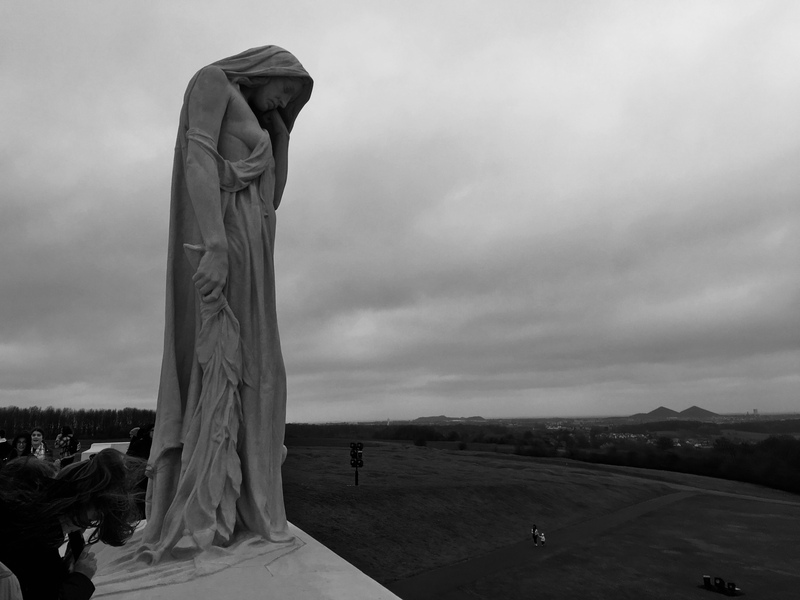 There is also undeniable sadness, especially when one sees the statute of Mother Canada, her eyes and head down in sorrow. 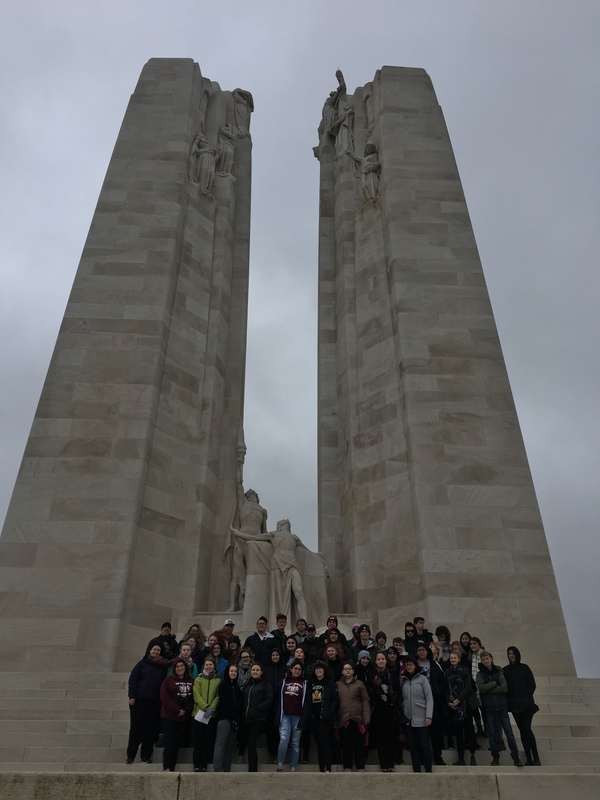 At the memorial we met Jessica, who is with the Vimy Foundation (which works to educate young Canadians about this part of our history). She did a little ceremony, and then presented us with our with our Vimy Pilgrimage medals, which are given to all young Canadians who visit the memorial). Following this we had a another short prayer service led by Ms. Papich. 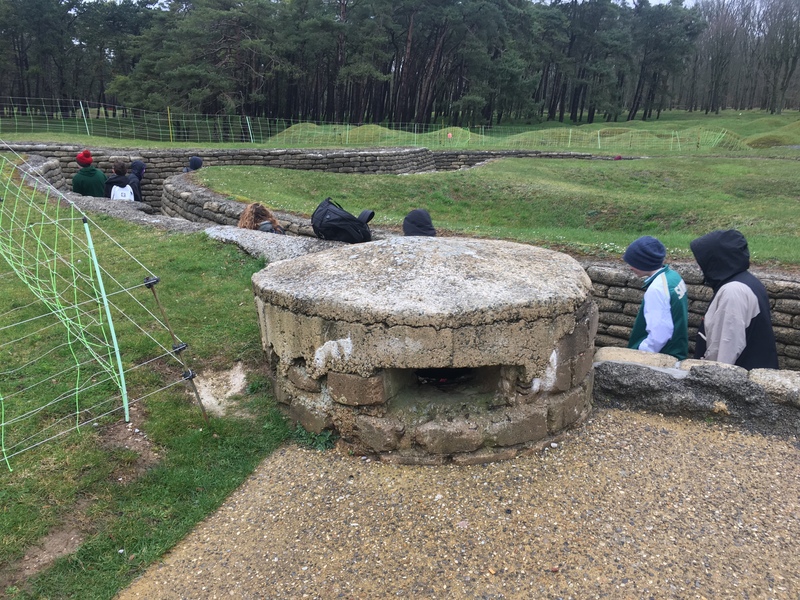 We had an appointment to visit the tunnels and trenches at 10:40, so there was a little time to look around the memorial. This is always a time for quiet reflection. I spent a bit of time taking in the Statute of Mother Canada; as I mentioned earlier it always gets me. Maybe now as a parent it takes on a lot more meaning and makes me think of my own boys (we were able to Facetime with them last night). I truly can sympathize with the sorrow of the parents and the nation as a whole; 60,000 Canadians represents a huge sacrifice on the part of an entire generation. Statute of Mother Canada, March 2014. 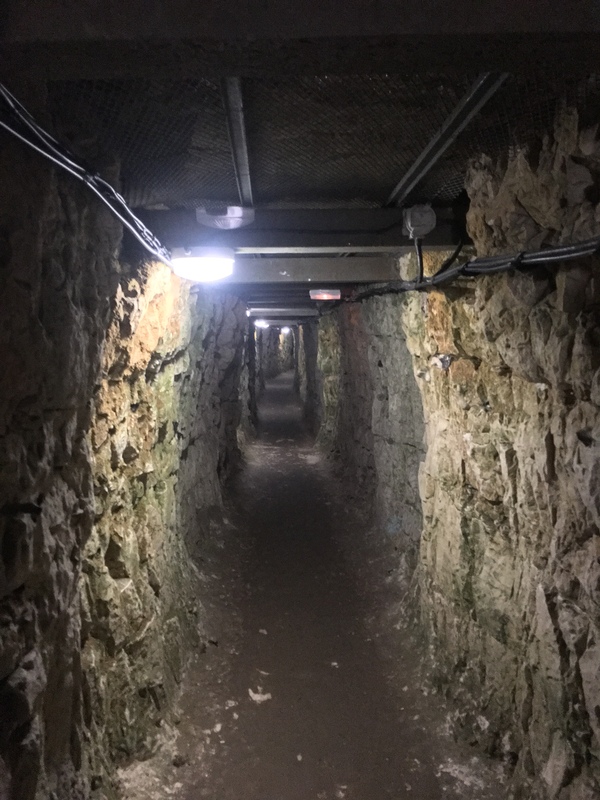 The tour of the tunnels and trenches was amazing! 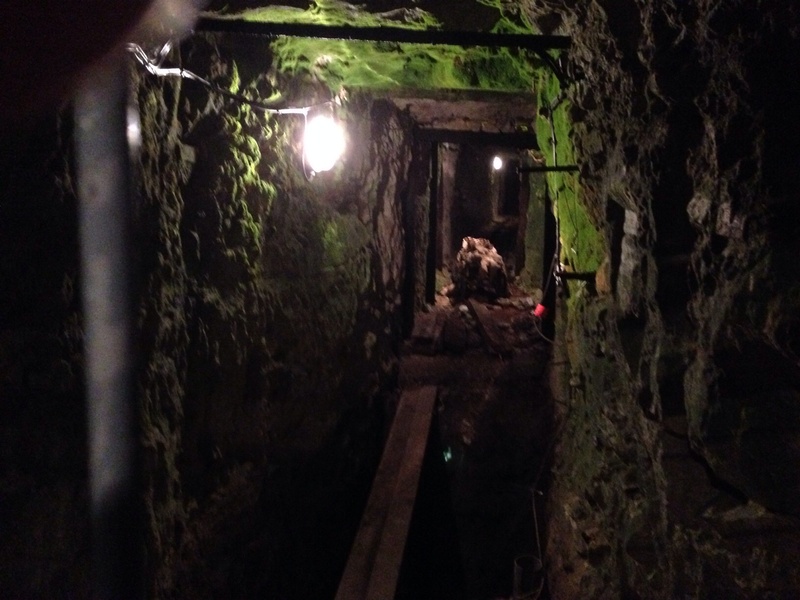 In 2012 we were able to see the trenches, albeit very rushed and the tunnels were closed. I had seen video of the Grange Tunnel before, but it was something to experience it firsthand. 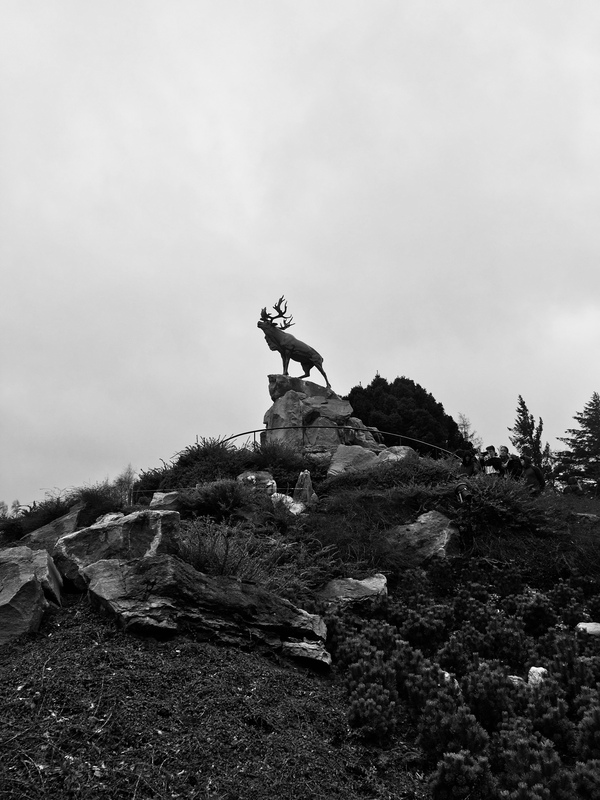 This piece of Canadiana really puts you in the place of the soldiers preparing for battle. Carved into the soft chalk, it allowed supplies to be brought forward safely and sheltered the men before the battle. I can’t wait to watch the video I shot when I get home. As I just mentioned, we literally had to run through the trenches the last time because of time constraints. This time was much more leisurely, and really allowed to experience what they were like. I shot a lot of video here as well, and I’m sure it will be a lot more detailed than my one from two years ago. 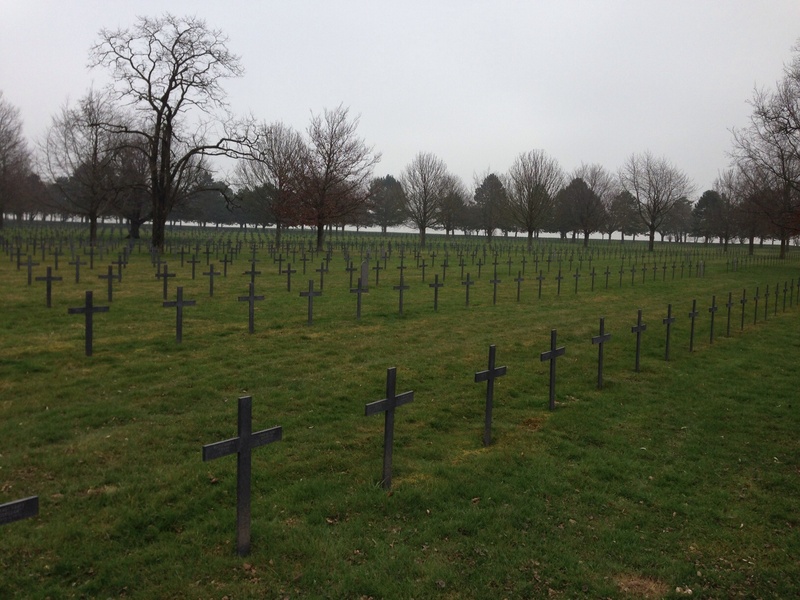 On our way out of the area, we stopped at a German WWI cemetery. I had seen and read that they have a very different feel than the British Commonwealth ones. The Neuville-Saint-Vaast Cemetery contains nearly 45,000 burials, usually with four soldiers to a headstone. The huge number of interments and the rows of crosses stretching on and on really make it much more sombre place. I think it made a big impression on the students. Neuville-Saint-Vaast German Cemetery, March 2014. It seems as though the sun is trying to poke out now; it has been very foggy this morning and as a result been very chilly. I hope it get warmer and goes up to the 15C or so it was supposed to be, since Dieppe is on the sea and will be a lot winder. Well, I’m going to have a nap for a little bit. We’re on our way out of Dieppe now. 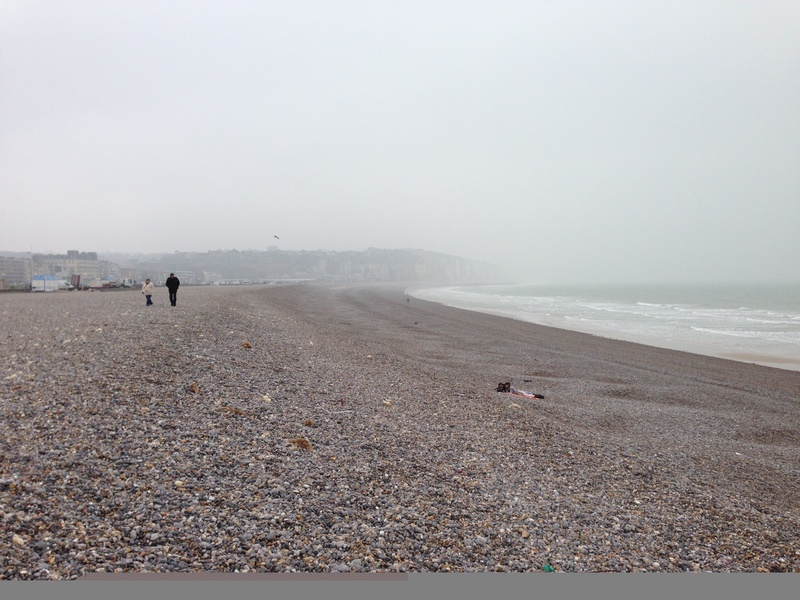 Unfortunately we did not have a lot of time in Dieppe, basically a little of time to wander around on the beach. I think it did give the kids an appreciation of the difficulties faced by the soldiers as they stormed up the beach. The headland cliffs are quite prominent, and the distance across the beach to the town is very far. The tide was much farther out than the last time I was here, and the climb up the beach was very steep. The sun refuses to come out and it is quite windy and cold on the beach. Too bad I don’t have my parka here! It’s late now and I’m just getting down to finishing the day’s entry. I’m a bit tired; we’ve travelled very far in a short period of time and saw a lot of things. We are settled in our rooms and the kids are in bed for the night. 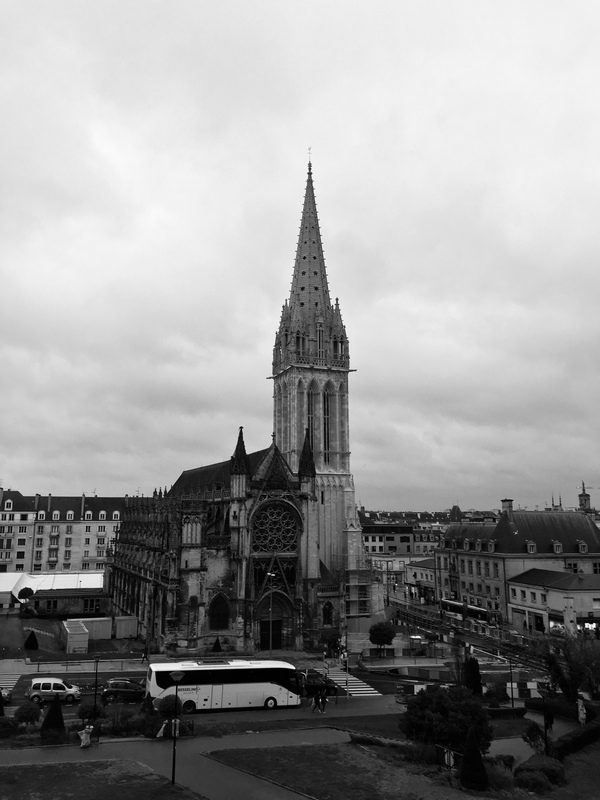 So after a drive of a couple hours, we arrived in Caen and turned south toward Falaise. Not quite halfway between the cities, near Cintheaux, lies the Bretteville-sur-Laize Canadian War Cemetery. 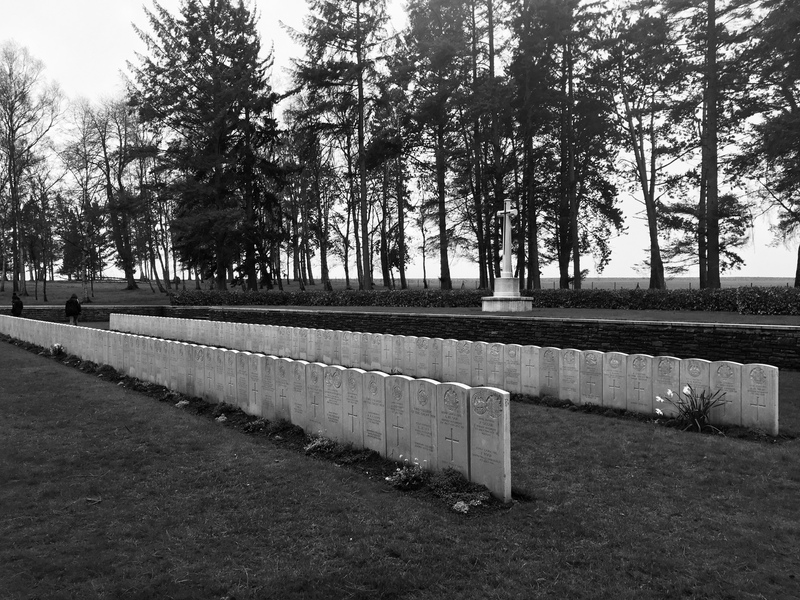 It is one of the two cemeteries in the area (we are going to see Beny-sur-Mer tomorrow) and contains the graves of nearly 2800 Canadians killed in the fighting in the area. We made a special request to visit this cemetery, since it wasn’t originally on our schedule. 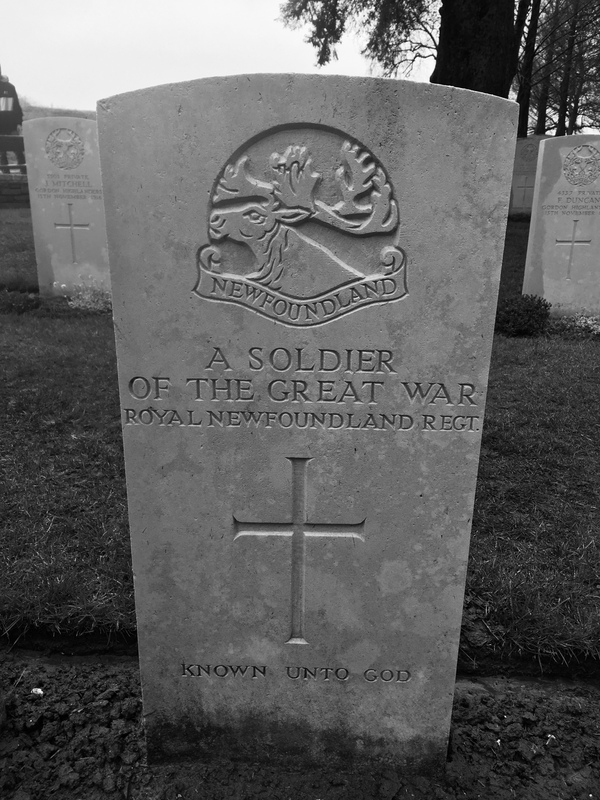 This cemetery holds some special significance since it contains the graves of soldiers from the Thunder Bay area, and also graves from those who served in the Lake Superior Regiment. In my Gr. 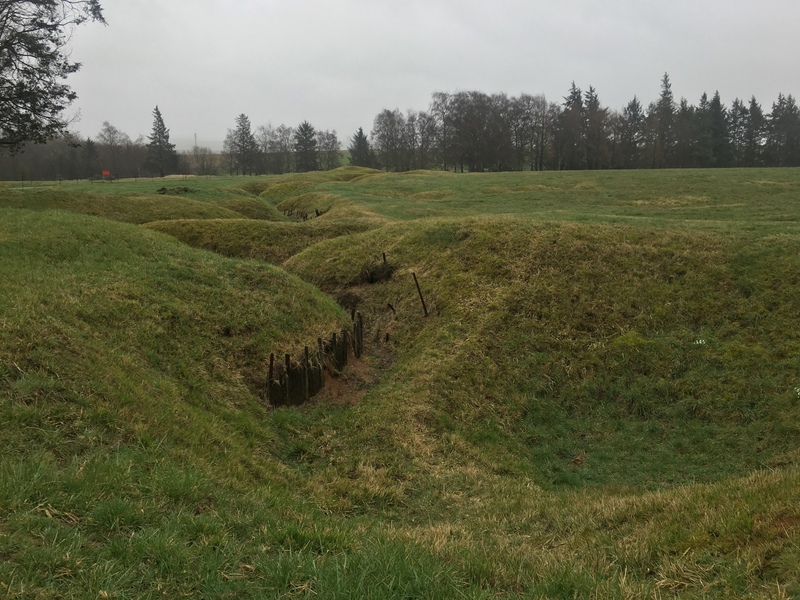 10 History class I teach my students about the Battle of Verrieres Ridge, which was a very tragic event in Canadian military history, but which remains unknown to many people. In that battle the Black Watch, the Royal Highland Regiment of Canada based in Montreal, was decimated during their portion of the attack on the ridge. Only 20 men survived unscathed from the 325 that began the day. Like our other cemetery stop, the students were assigned graves to visit. We began with a prayer service at the entrance to the cemetery and then proceeded into the site to view the graves. I assigned myself Major Phil Griffin, who took command of the Black Watch during the battle and was killed leading his men forward. In addition to their own soldier, I gave all the students a special task; they were to visit the grave located at XVI G 11. 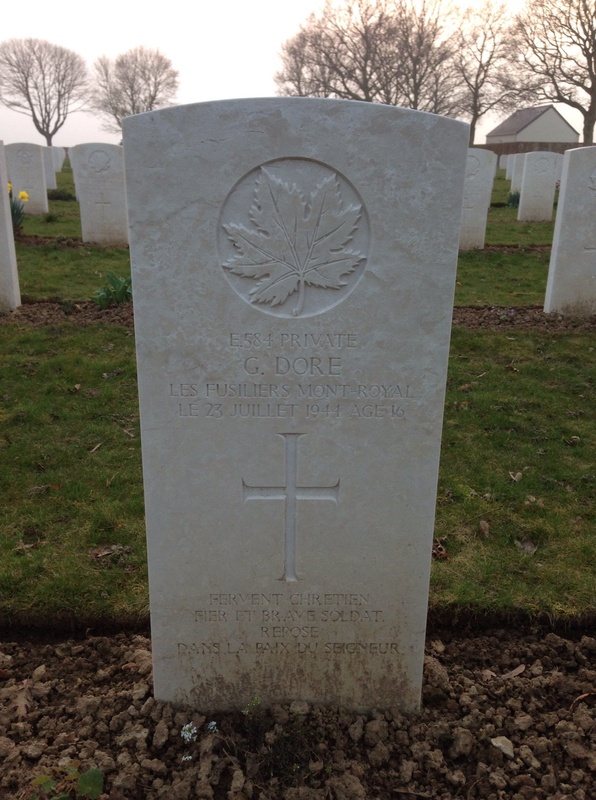 Buried at this location was Private Gerard Dore, who was killed on July 23, 1944 serving with Les Fusiliers Mont-Royal. He was only 16 years old. I thought that this would help to emphasize the tragedy that is war. 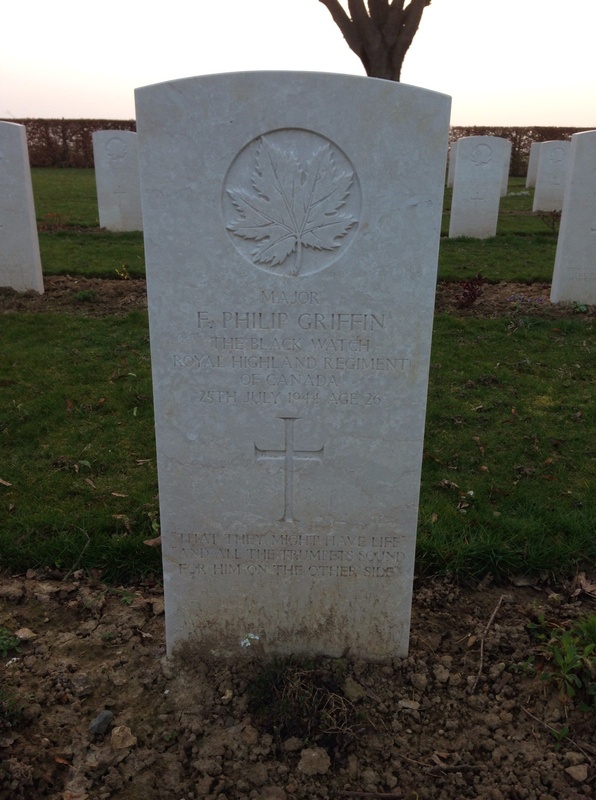 Grave of Maj. Griffin, March 2014. Grave of Pte. Dore, March 2014. 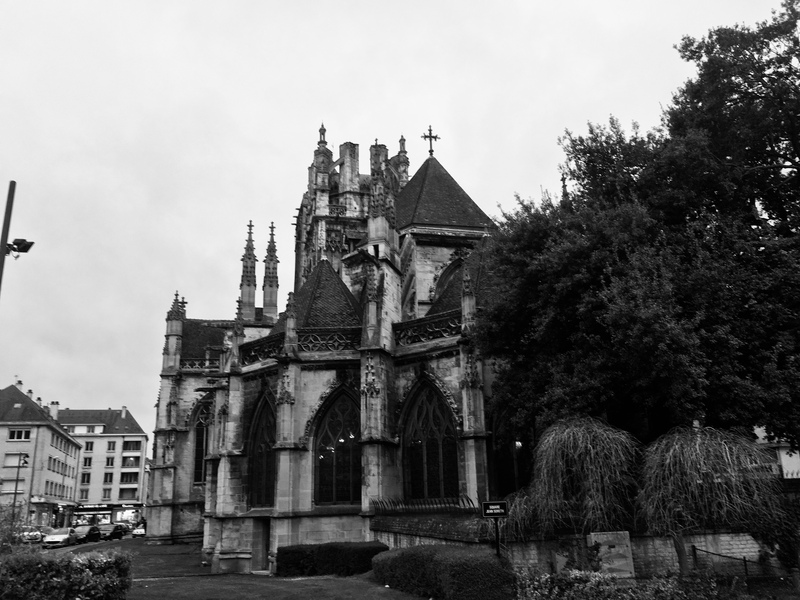 After our visit we drove back through Caen and turned northwest toward Colombiers-sur-Seulles and the Chateau du Baffy. It is too bad that we arrived after dark and we really could not see much of the buildings and the grounds as they are sure to be quite amazing! The chateau was constructed in 1735 and served as a German Headquarters during WWII. I’m sure we’ll have a chance to look around tomorrow during the day.